Sportsmobile, our original name was Sportswagons, was founded in El Paso, TX by Curtis and Charles Borskey. Curtis resigned in 1964. Charles is still working. In 1964 the company relocated to Indiana and changed the name to Sportsmobile. Sportsmobile Texas was started in Austin, TX in 1984. Sportsmobile West was licensed to build Sportsmobiles in 1990. Sportsmobile Texas is the principal office serving as the coordinating point for design, marketing, quality control standards, etc. 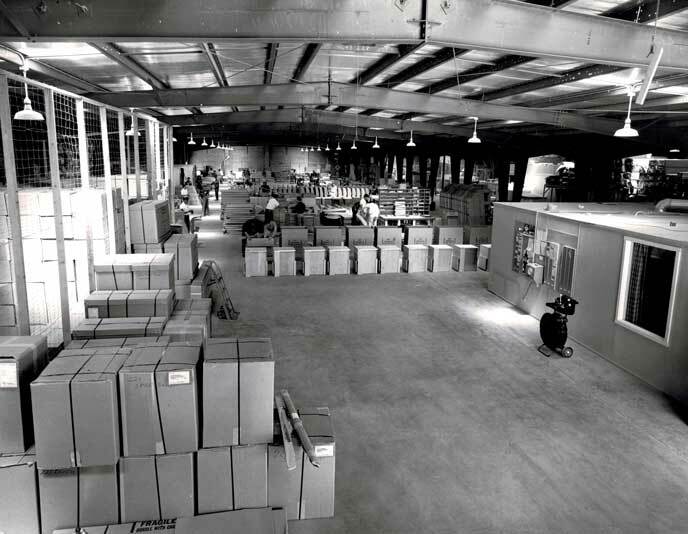 Our original plant in El Paso, Texas. 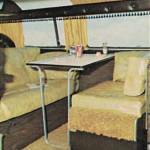 We first began manufacturing van camper conversion kits for Volkswagen of America in 1961. The kits were transported to VW ports of entry from Germany. After the vans were unloaded from the VW ships the kits were installed. Converted VW van campers were then transported to VW dealers for sale. 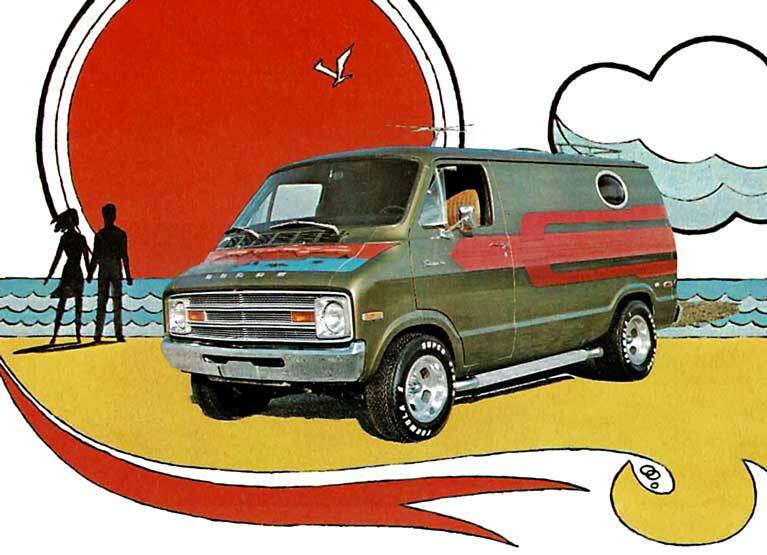 A similar arrangement was made with the Ford Motor Company, except the Ford camper kits were shipped to Ford’s plant in Ohio. Manufacturing the camper conversion kits. Packaging the kits. There were 5 crates per kit. Ready for shipping by truck or rail to the installation locations. Ready for sale. The top rack and awning were separate options. Our first conversions. The vans and our conversions were state-of-the-art at the time, but very basic compared with today’s. The van’s engine was located between the cab seats. They were a little underpowered, and noisy, frontal crash protection not much. A/C open the windows! To raise our first top you climbed up the rear ladder and crawled in through the rear, while pushing the top up. To lower – reverse the procedure. The interiors were functional and attractively furnished. As stated above they were quite basic. The icebox required a block of ice. The toilet was a bucket with a seat. Fresh water was in a 5 gallon jerry can. Etc. There were no federal safety standards or RVIA codes for electrical, plumbing, and propane. Seat belts, air bags? Not till a couple of decades later. Fast forward to today. Amazing improvements in the vans and conversions. 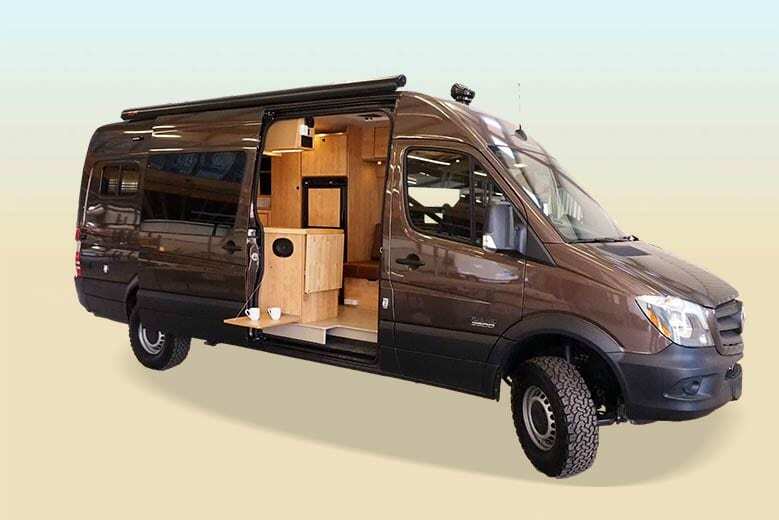 Camper unit transforms the Ford Econoline into a home-on-wheels that’s especially comfortable. Dining area converts to double be, and with 60 inch bed over the engine cover and sleeping accommodations for two adults and two children are provided. Optional cabana tent provides additional camping room. Interiors attractively finished in birch paneling, red or turquoise upholstering, plus matching curtain materials. Awning-type windows for rear doors. loaded front and then the rear. It was a little cumbersome. Good space organization is an enticing Sportsmobile feature. The open floor plan has logical, practical divisions of space for food preparation, dining, sleeping, and living. Generous counter space and storage areas. Roomy, comfortable double bed with 4″ elbow space to rear. The bed is 4″ firm foam covered with Scotch-Guarded Nylon. Makes up easily by using one backrest cushion, with its folding legs, for center section. Large louvered windows let soft evening breezes in for comfortable cross ventilation . Bed can be left made-up during travel. – 1973 text. Our first pop-top that raised and lowered from inside the van. It provided more space, ventilation, and visibility. Plus you didn’t have to bend over to put your pants on. The interiors were more comfortable with a lot more features and options in the 70s. An example, the ice-box was replaced with a refrigerator. Later we developed our "Penthouse" top. Others had elevating tops but ours was the first full roof size with a mattress bed in place of a hammock. Plus we engineered our dual u-tube, spring loaded, raise/lower from one position, patented elevating system making it easy to raise and lower the top manually. Later we added power – just push a button! Much More Than a Conventional Automobile! The Clubcar was a special model built for VW distributors. It was designed more as an alternative for family use with some camping capability — in place of a car. The rear seat was exceptionally comfortable with a lounge position. That would convert into a bed. A large moonroof was in the ceiling. The congenial way to go in real luxury and comfort — there’s nothing else lie it… SPORTSMOBILE SURFER. Beautiful, soft, luxurious comfort surrounds you — moves with you… for total enjoyment! Wow! This was quite a departure from our more conservative approach to styling. This wild thing was first popularized in California. We decided to develop our own version with lots of fake fur and shag carpet to see what the market might bring. To our surprise – we couldn’t build them fast enough. However, after a few years sales steadily declined. So we quit. pleasure. Always ready to go on a moment’s notice.” – 1973 text. This conversion plan was one of our most popular in the 70’s. Still is – updated. Favorite colors were avocado green and harvest gold. Short shag carpet and dark walnut cabinets were also first choices. Plaid upholstery later took over. 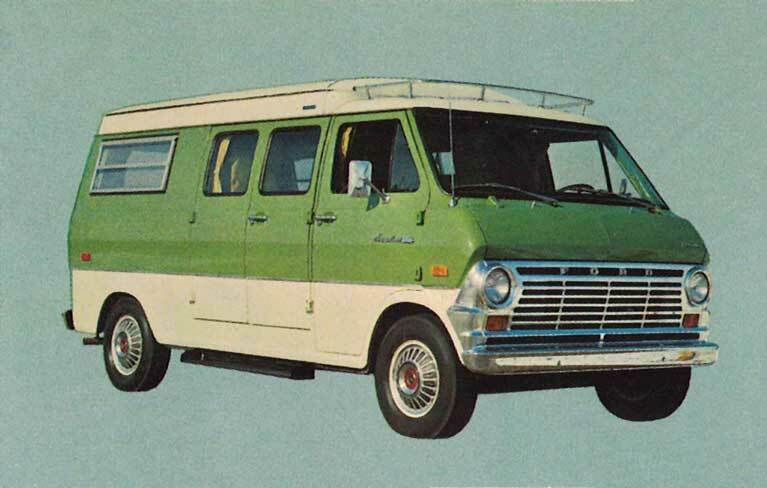 4×4 conversions were available for the Ford Econoline vans in the earlier 70’s (1971 Ford in photo). Sportsmobile first used the Pathfinder 4×4 conversions for years. They were tough and rode rough.To engage the 4×4 you had to get out and lock the hubs. Today’s 4×4 have an electrical system that selectively brakes individual wheels for increased traction and stability. Plus many other improvements. Including a nice ride similar to a regular van. As fast as technology is moving — who knows what vans and conversions will evolve into.